I would like to use Google Public DNS (8.8.8.8,8.8.4.4) at home, but the school firewall works through DNS, so using a custom name server disables accessing the internet. Is there any way to automatically use Google DNS at home, but switch to auto-configure when at school? It's annoying to have to switch it between home and school. I do this because I notice significant speed increases versus the Comcast DNS. I'm on Windows 7 Home Premium x64, and I'd have no issue with installing third-party software or scripts in order to solve the issue. Sometimes access to the router is not an option. 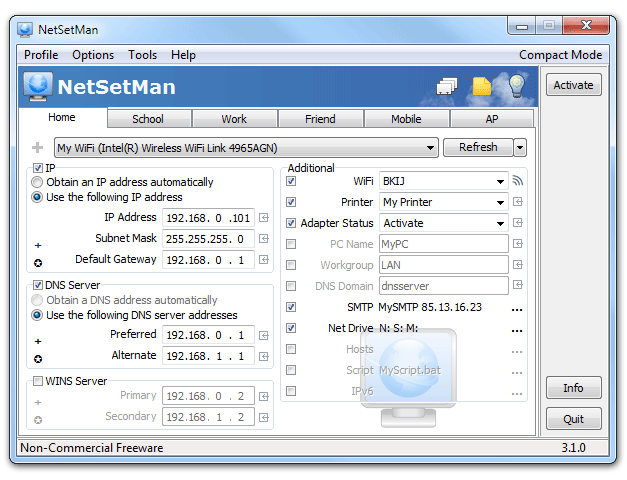 Check out NetSetMan. It lets you define settings per network. Also, here is the link to the blog about this tool and other similar ones, which got me to try the application in the first place. Not the answer you're looking for? Browse other questions tagged windows-7 wireless-networking dns firewall google-public-dns or ask your own question. How to force DNS for specific clients?